It is that day again. The one that has come every year for the past 62 years. Yes it is my Birthday. I really don't know how the number got to 62. Wasn't I 26 last year. Oh well all is good and I can't complain. Life is good, except for the sinus infection. Ok I have to complain a little. I went to the Dr yesterday and she said, "Yes you have a sinus infection but you have to call me tomorrow for meds because you haven't had it long enough." Really, it has been a week! So now I have to suffer one more day and not feel good on my Birthday. I told her it was my birthday and that didn't make any difference because, "studies show". They never study me. When I get a sinus infection give me meds and it goes away. I have been doing that longer than she has been alive. Oh well sorry! I am off my soap box now. The Dickens people are singing Happy Birthday to me. And that is my big wonky cake. Here is the process vide. I am having a give away, but you have to watch the video to see what it is. Thanks for stopping and helping me celebrate! HAPPY BIRTHDAY Linda I hope that you have had a good day inspite of a sinus infection, I hope that you feel better soon. 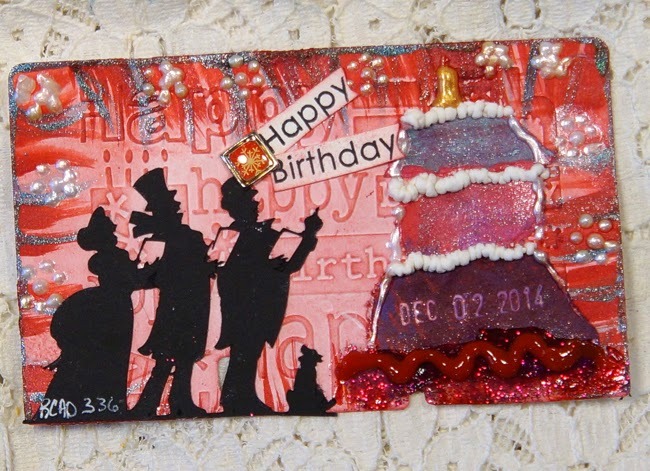 Linda I absolutely love this card the Dickens theme is awesome, so well designed. Love this one Linda - great xmas theme and love the silhouette people - very effective! Thanks also for the link for Silhouette you left for me!